Think you can go quicker? Maybe. I didn't think I could go this fast in the 1st place. Ben joined the Braves' stable with 10 Full Ironman races under his belt. After a promising race 6 years ago in Melbourne (11:20), despite a large training volume, he had struggled to improve since then. We started with a clean slate by cutting his training volume in half and after identifying that Bike Strength was his major limiter, took it back to basics with some simple but tough work on the trainer. Along the way, we added a dedicated strength regime to his weekly schedule and cleaned up his diet. The result was vastly improved bike fitness and long-distance running efficiency. We're very happy that Ben was able to race his quickest Ironman ever after 8 years with a 11:04 in Texas. Well Done Mate - you've come a long way! I am married with two boys a 6yo and 3yo, work full-time running the SEA region for Telstra and sit on the Board of AustCham. I started triathlons about 9 years ago in Singapore as a way to keep fit and a new challenge following the completion of a marathon. The first Sprint in Singapore I nearly died, walking most of the run, still I pushed on and moved to Olympic, a 70.3 and then in 2010 an Ironman, one week before my wedding. Crossing the line I thought that was the first and last, why go through all that again, job done. I have since completed 11 full Ironmans. Triathlon is about constantly learning and evolving. Learning new time efficient training methods, sound nutrition, and understanding how the body reacts. Love the defined challenge and goal, the fun of travelling to different locations around the world and meeting new people. 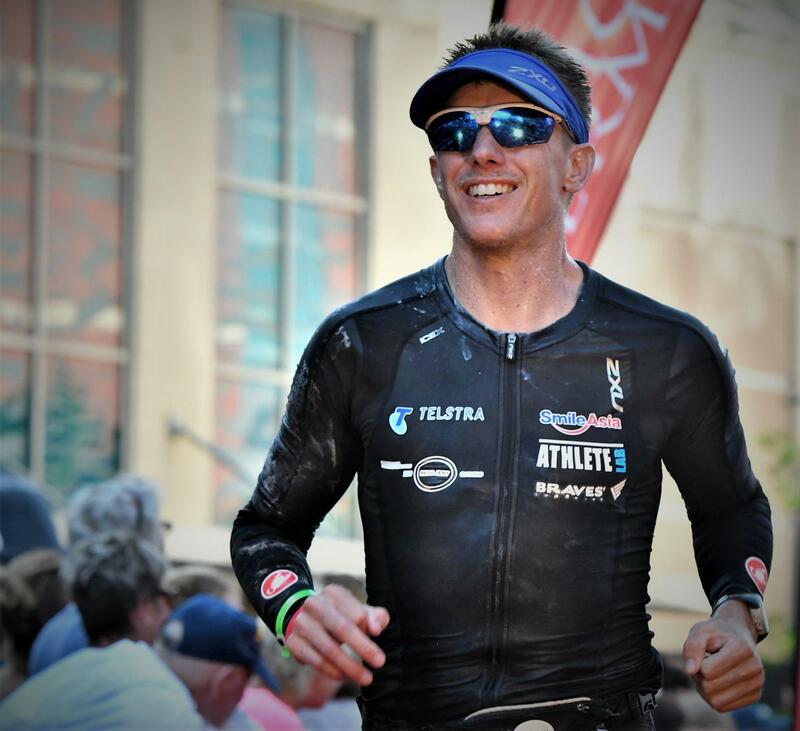 From the crawling round my first sprint to my first Ironman in Busselton, there was a tremendous sense of achievement when I crossed the finish line. I stopped for two years and then finished IM Melbourne in a a good time of 11:20hrs. Completing that event with my two brothers made it extra special. The next race in Japan would lead into a new goal and the dream of racing in Kona through the Legacy program after completion of 12 full Ironman's. My plan is to do a different race each time and to complete one on each continent and each of the regional Championship races. The low point of racing to date has been in Taiwan, coming off a brutal hot bike ride and watching the athletes already on the run, working their way up a hill in full sun along the outer wall of what looked to be a jail. 4. 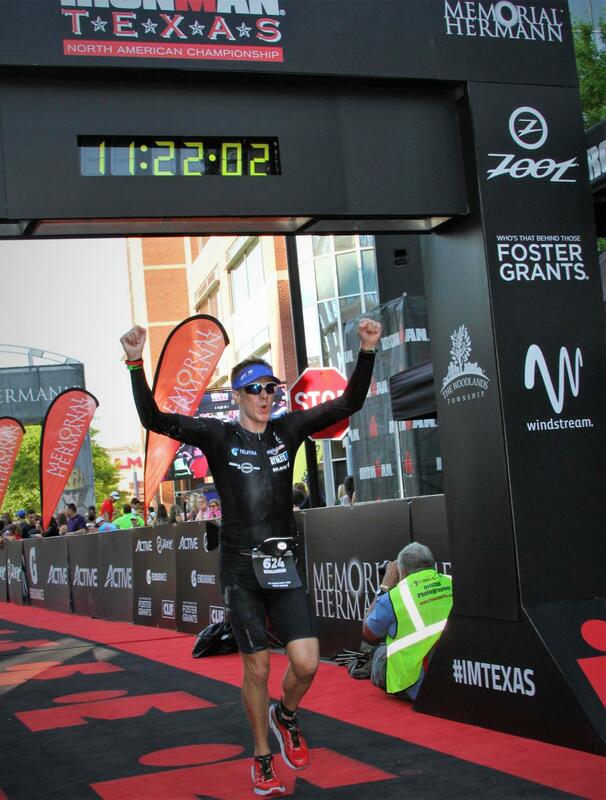 Briefly talk us through your most recent race at IM Texas. race. High/ low points during the race. Standout thoughts at certain points in the race. 6:40am the swim began. Following Shem's advice I stayed in the second batch, 1:00 - 1:10Hr near the front of the rolling start. My strategy was to find people to draft off but the brown muddy water and a good deal of kicking and hitting made this tricky. However I felt strong and confident so continued on. Eventually spotted a guy in a bright wetsuit who I would follow all the way in. Crowds lined the shoreline of both sides of the canal, screaming and cheering. My swim was 1:08hr. Not bad, but I was hoping for a bit quicker. Bike for the first 20 miles wound through the city. Once at the highway it was quite nice. My pace was strong and I looked to not push too hard, saving my legs. The highway road was not pretty, there was little to look at, but it was fast. I would turn with an average of 33km/h. Headed back with a tailwind was fast and it felt great. Then at the final turn back, I found myself pushing into a light headwind, it was hard work and I began to tire. Pushed and pushed, through the pain and mental strain as it was no longer fun. Finally, the last turn on the highway came and it was a 15-mile ride back into transition. I would finish in 5:17hr an unbelievable bike split for me. In transition, I was tired and spent a fair while in the bathroom before a while in the change tent. Then I was onto the run. The cheering was phenomenal, my legs were moving which was a good start. Vaseline covered my neck from the terrible chaffing the wetsuit caused. Step by step I began the first of three laps. My stomach did not feel that good, slowly I worked through it with some water and bits and pieces from each of the aid stations. The course went down by the river front where there was some absolutely tremendous support, people dressed up, music pumping and everyone cheering. It sent a tingle down the spine. Finishing the first lap I was feeling pretty good, 14km done and I chanced a look at my watch to see I was doing good time. My stomach was clearing up and I was able to take more nutrition. Got through the second lap with not much drama and I was on the third and final. Looking at my watch I was at 9:42hrs. Under 11hrs was in sight! The gel I had meant I was buzzing and felt really good. Ran the first couple of miles at what I felt was a hard pace. Imagine a sub 11hr Ironman! I tried hard to limit time at the aid stations and keep moving. The miles were coming. I thought if at 23 miles I was 10:30hr I would be in decent shape. It came 10:32hr. A bit behind my target but I pushed on. 2 miles left at 10:43hrs. A gel, Red Bull, and I pushed with everything I had. I started up the final hill and took a look at my watch 11:02hr.....noooooo!! It was two more turns, and down the chute to cross the line in 11:04. Texas was done, I was an Ironman for the eleventh time. My training was long but drifting for a long time. I believe I put in the hours but was not gaining the most of each session. Shem changed that. I found that I was training less and having better quality sessions. Towards the end, the full Ironman load got up to 18 - 20hrs/ week, but this was for a relatively short period of time. The impact of this better quality training, resulted in a vast improvement in my results and a more enjoyable race. 6. Please share with us the 2 most important 'take home' messages that you have learnt about endurance training and racing that everyone needs to hear. - Trust in the plan and the process, don't try and do too much more or less. - Enjoy the journey and all the learning that comes with it, many aspects can be utilized in other parts of life. The setup at BRAVES' Coaching takes training and race preparation to another level. The App gives easy access to each day's session plan and allows for immediate feedback. It was often these comments from Shem that showed me how to optimize the quality of each session. Being able to sneak in some face time with the coaching team at the BRAVES' squad sessions really helped to build confidence and results. 8. Any 'life lessons' you've picked up along the way? The process is full of life lessons; race preparation the night before, to time management and working towards long-term goals with a series of short-term achievements, these are all lessons I treasure. I am also learning how to eat properly and train effectively. A coach helps with focus and achieving more out the time you put in. I was able to understand the structure that Shem applied to my training and the adjustments he made through our constant communication and feedback have also been critical and proved to be a big advantage over following a generic pre-set plan. Having a coach passionate about the sport and someone who you feel is with you on the journey is priceless. Ironman Philippines in 4 weeks and hopefully crossing the line for IM number 12 and qualification to Kona. 11. Think you can go quicker... ? Maybe. I didn't think I could go this fast in the 1st place!